Birgit Morilon, is a Programme officer for eHealth, Well-Being and Ageing, European Commission’s DG Connect. Part of her brief is to manage the EC’s relationship with AAL, which includes working with the AAL community on strategies to build on the many achievements the programme has made over the past 10 years and how it should transform to be ready for the future and Horizon Europe. 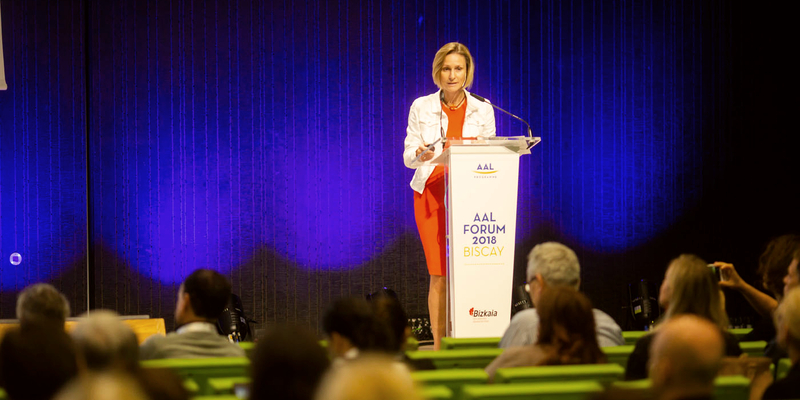 After speaking at the AAL After 2020 debate during the first plenary session, she explained why the future looks optimistic for those working on active and healthy ageing. These are very exciting times for Europe at the moment. There are many new proposals on the horizon, in particular, the new financial framework that is currently being planned for the next Commission. As part of this, the next Research and Innovation Framework Programme has been announced. Called Horizon Europe it includes huge scope for both digital and health research, so the concept of ageing well in the digital world, the AAL’s new mission statement, totally fits in there. There is also a focus on partnerships in Horizon Europe and we want to use communities like the AAL community to help shape European policy with a bottom-up approach so we are really listening to what’s happening in the regions, in the member states and in municipal principalities. We want to involve every level of society in creating the right environment that can help European citizens age well in this digital world and remain active and independent at home for longer. And we see partnerships being the crucial instrument for that. While this is, of course, a global challenge, we also see the need for this to be tackled at the local and regional level and the EU strategy will reflect this, which is why we want to give local users a voice. The challenges may be similar across Europe and the world, but culture, ecosystems and regulation may differ from country to country, region to region, so we need different plans but an integrated approach. This makes Europe a very fragmented landscape in terms of its health and care provision – but AAL can open up the barriers that may exist by being in touch with local authorities across borders and by exploring different markets through their projects and the products and services they develop. Running next to the new research framework, there is a new programme called Digital Europe with which we will be focusing on keeping Europe as number one in the digital transformation of its society. This will involve focusing on a technology perspective, like artificial intelligence, high-performance computing, robotics and seeing how we can use this technology in order to transform how we do things on the societal scale – so the digital transformation of health and care is a clear example of this. At the European level, our biggest asset is the public health systems we have, but they are constantly challenged – they are budget-pressured and there is an increasing scarcity of resources, for example. So, we really need to work on how technology can support the transformation of these health systems so we can keep them sustainable. And though technology will have a huge part to play in this, it should not be the driving force, people should be. While there are many opportunities to come on digital, on health and on the combination of both in the new programmes, it is also time now for the AAL community, the people at the forum, to raise their voices and let us know what they need from their perspective at the European level, from a policy perspective, an economic perspective and also what they need as a European citizen.